For the past few weeks, I’ve had an extreme craving for French Macarons. I don't normally eat them, but when I do, I am reminded of why these sweet creations are a staple amongst French culture (and now the world!). And so I decide to embark on the difficult task to make these delicacies and was pleasantly surprised that they weren’t as impossible to make as I had thought. Besides a few critical steps, it seemed the key to success was knowing when to stop folding the batter and how much to beat the egg whites. I’ve been watching many videos on how to make macarons and discovering useful guides, which I’ll post below. I found it really helpful to watch videos that go into detail each step of the process and to actually see what the batter consistency was supposed to look like before attempting at it. How to make macarons - some tips and tricks by Eat. Live. Travel. Write. Along with most people, I’ve been on a matcha food craze. I like to call it matchamania. If it’s not in cookies, ice cream, breads, tea, smoothies, it’s in lattes and tiramisus. Because I am an avid green tea drinker and absolutely love the raw, earthy flavors of matcha, I thought it would work wonderfully in macarons, complimenting the sweet airy taste of the cookie. For the filling, I kept it simple with a white chocolate ganache. The buttery richness of the white chocolate is enough to balance out the deep, bitter flavors of the matcha. Also the ganache super easy to make (and lets be honest, after fastidiously making the macarons, the last thing you want is a finicky filling). You could obviously use any chocolate you’d like for the ganache, or keep it simple with your favorite jam or buttercream. You could even add a teaspoon of matcha into the white chocolate ganache and make a double Matcha Macaron. These delicious treats are great for gifts or as party favors or to enjoy with some tea! 1. For the almond portion, you can use almond flour/almond meal, or ground up your own almonds, as long as they are blanched and unsalted and your food processor is strong enough to make a fine ground! The almond flour/meal should be 100% ground almonds. I like to use Bob’s Mill for the almond flour because it’s one less step in the process and it has a pure almond taste. 2. I had to use a lot of green food coloring, maybe it was the brand but just use as much as you want until the desired color it reached. Just know that the color will fade a bit when you bake the cookies in the oven. You can use food coloring gels and those actually might work better. 3. Before baking them off, letting the cookies rest is a crucial step to achieving the “feet” on the macarons (the ruffled edges). It’s important to let the cookies rest in a dry, cool area. If it’s too hot and humid, you will need to let the macarons rest longer until they are dry to the touch. 4. You know the macarons are done when the lift off the parchment paper. If the bottom gets stuck and breaks off you know the cookies need more time. A useful tip I read is that if you are having trouble getting the macarons off the parchment, even though they are fully cooked, gently lift up the parchment and add a tablespoon of water, when the pan is still hot. This will add steam and help lift the cookies off from the sheet. Make sure the water doesn’t actually get on the parchment paper. 5. Last but not least (and most importantly), have fun! 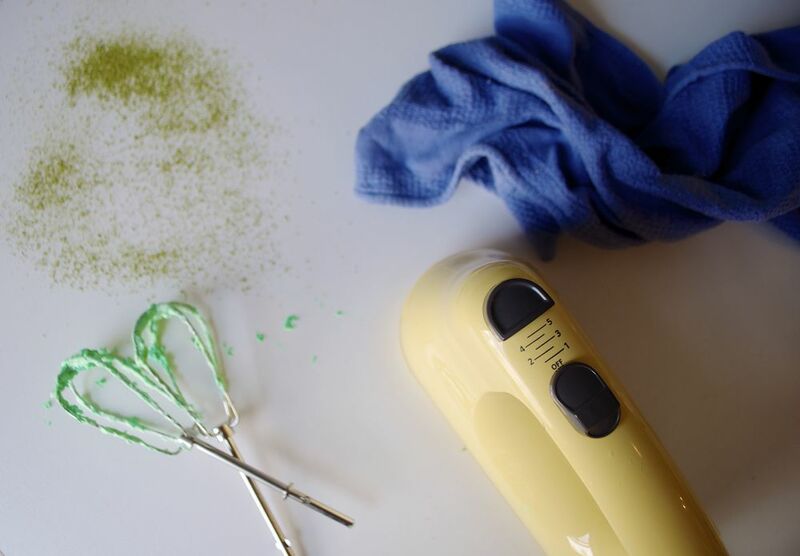 Tag your Matcha Macarons with #friedparsley on Twitter or Instagram! ****You can now also view the recipe on Food52. Woohoo!! Preheat oven to 350 degrees. Line a baking sheet with parchment paper. Using a cap or cookie cutter to draw out 1 1/2inch circles, about 1 inch apart. This is to ensure the macarons will be roughly an equal size when piping out the batter. Flip the sheet to make sure the stenciled side is face down on the cookie sheet. Using an electronic mixer or standard mixer, beat the egg whites until foamy, about 2-3 minutes. Gradually add the granulated sugar and continue to beat on medium high speed. Once the sugar is incorporated, add the food coloring, until the desired color is reached. Continue to beat until stiff peaks form. This whole process should take about 8 minutes. You will know it’s ready when you pick up the batter with a whisk and the mixture retains solid peaks. Set mixture aside. In another large bowl, sift together the almond flour, confectioners’ sugar, and matcha powder and stir to combine. Add half the dry ingredients to the egg mixture. Using a rubber spatula, fold the dry into the wet mixture until just incorporated. Then add the rest of the dry mixture, and like before, fold until combined. Continue to fold the batter until the consistency reaches a lava-like texture. At first the mixture will seem dry and 'un-mixable,' but keep mixing until when you lift up the spatula, the batter will slowly stream down in thick ribbons. It shouldn’t plop or clump down - this means you’ve under mixed it - but it should also not ooze down into thin, liquidy ribbons (this means you’ve over mixed it). They say it takes around 50 folds all together to reach the right consistency and this actually worked for me and was really helpful! Spoon the mixture into a piping bag with a round tip or you can use a zip lock bag and snip the corner. Pipe the mixture into the 1 1/2 inch rounds on the baking sheet, about 1 inch apart, using the stencil as guidelines. This is to ensure the cookies will all cook evenly. If there are any points sticking on top of the cookie, use a damp finger to slightly press down and flatten the peaks. Tap the baking sheet down 3-5 times onto a flat surface to remove any air bubbles. Let cookies rest in a dry, cool place for 30-45 minutes, until dry to the touch. Place cookies into the oven and bake for 10-13 minutes, until firm and golden. If you pick up one of the cookies and it sticks to the parchment paper, it’s not ready and needs more time. Once baked, remove macarons from the oven and place onto a drying rack to cool. Chop the white chocolate into small pieces and place into a heatproof bowl. In a saucepan over medium high heat, bring the heavy cream to a boil. Pour the cream over the chocolate and let sit for 30 seconds. Stir the chocolate until it has melted and is fully incorporated. Place into a piping bag and let chill in the fridge for at least 10 minutes before applying it to the macarons. To assemble the macarons, pair up the cookies of equal size/shape so there’s a top and bottom. Pipe the ganache onto the center of the bottom macaron, making sure to avoid the edges. Place the other macaron on top and gently press down to attach. Do this with the rest of the macarons. Store the cookies in the fridge or at room temperature (if it’s not too hot) for a few days. If you do place it in the fridge, I like to bring them to room temperature before eating. Bon appetit!